The days are numbered for two newly discovered dead stars locked in a spinning spiral of doom that will eventually lead to a catastrophic collision that triggers a supernova explosion, astronomers say. The stellar corpses — highly dense objects known as white dwarfs — were spotted inside a dense cloud of gas and dust known as a planetary nebula. Currently, the white dwarfs orbit each other once every 4 hours, but their orbit is shrinking, and in about 700 million years, the two white dwarfs will see a cataclysmic crash, scientists said. They also created a video animation of the star collision to show the cosmic smashup. When the fires of fusion stop burning in the heart of a star, the core may collapse into a highly dense object called a white dwarf. Meanwhile, much of the material that once made up the outer layers of the star is released into the surrounding area, and may form something called a planetary nebula (which, despite the name, doesn't actually have anything to do with planets). The newly discovered pair of orbiting white dwarfs was first spotted by astronomers studying a planetary nebula called Henize 2-428, using ESO's Very Large Telescope. The astronomers were initially studying Henize 2-428 because it is asymmetric, and scientists don't fully understand why some nebulae are oddly shaped. "When we looked at [Henize 2-428]'s central star with ESO's Very Large Telescope, we found not just one but a pair of stars at the heart of this strangely lopsided glowing cloud," Henri Boffin, an astronomer at ESO and a co-author on the new study, said in the ESO statement. The researchers say the presence of a second star could explain the lopsidedness of the nebula. "Further observations made with telescopes in the Canary Islands allowed us to determine the orbit of the two stars and deduce both the masses of the two stars and their separation," said Romano Corradi, a researcher at the Instituto de Astrofísica de Canarias in Spain's Canary Islands and a co-author on the study. "This was when the biggest surprise was revealed." The researchers found not only a two-star system, but also what they say is the most massive orbiting white dwarf pair ever discovered. The two stars have a combined mass of 1.8 times the mass of the sun. In the next 700 million years, the stars will merge into a single star. Without fusion to keep it puffed up, the new star will collapse on itself, generating a type Ia supernova explosion, the researchers said. 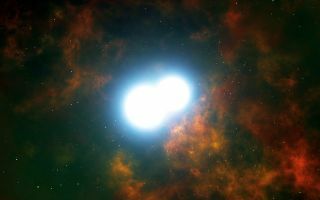 Type Ia supernovas are known to form when a white dwarf merges with another star, like a puffed-up red giant (as opposed to Type II supernovas, which form when a single star dies and collapses on itself). "Until now, the formation of supernovae Type Ia by the merging of two white dwarfs was purely theoretical," said David Jones, one of the paper's coauthors who was an ESO Fellow at the time the data were obtained. "The pair of stars in Henize 2-428 is the real thing!" All Type Ia supernovas are thought to burn with equal brightness, making them so-called "standard candles." Scientists can measure the apparent brightness of a standard candle, compare it with the actual brightness, and then determine how far away the object is. "It's an extremely enigmatic system," said Miguel Santander-García of the National Astronomy Observatory in Alcalá de Henares, Spain, and leader of the new study. "It will have important repercussions for the study of supernovae type Ia."